A s a non-lawyer who writes often about legal topics, the last thing I want to see in my email inbox is a message from a nationally recognized legal expert who is pointing out a mistake in something I wrote. That’s what happened a few weeks ago, when Heidi Tandy dropped me a note to correct some facts in an article I published about common copyright myths related to fan fiction. Tandy is “of counsel” for Intellectual Property at the law firm of Price Benowitz LLC, and she’s one of the top experts on fan fiction, copyright law, and intellectual property. She’s one of the founders of Fiction Alley (one of the largest fan fiction sites on the Web), and is one of the featured writers in the Amazon.com best-seller Fic: Why Fan fiction Is Taking Over the World (Smart Pop). Nobody likes to be corrected, but of all the people in a long life who’ve decided to set me straight on something, none have done so with more grace and humor than Heidi Tandy. Within a few minutes of starting the conversation, it seemed more like a chat with a friend I had just met but liked a lot. Wow. When I was younger and much more self-conscious about my work, I could have used an editor with her people skills. In my original article, I repeated the copyright rules I learned at university long, long ago. And Heidi Tandy explained how several legal cases have changed the copyright framework since I went to college. She also gave me a quick lesson in how today’s courts view transformative works – that is works based on an idea that may be protected by copyright, but are “transformed” into something new and fresh by the second artist. “The changing view of copyright law began with the 1994 U.S. Supreme Court decision in Campbell v. Acuff-Rose Music [(92-1292), 510 U.S. 569 (1994)],” Tandy explained. The case claimed that 2 Live Crew’s song Pretty Woman, infringed Acuff Rose’s copyright in Roy Orbison’s rock ballad, Oh Pretty Woman. In the court’s opinion, Justice David Souter wrote that 2 Live Crew’s song did not infringe on Acuff Rose’s copyright because it was a parody, and therefore fell under the Fair Use exception to the copyright law. Justice Anthony Kennedy, in his concurring opinion to the rare unanimous decision in this case, listed the four rules that courts must consider in a Fair Use exception to the copyright law and explained how 2 Live Crew had met all four of the exceptions. But it was Justice Souter’s majority opinion that asked whether or not the parody was a “transformative work.” In fact, Justice Souter said that the central purpose of this investigation is to see whether the new work “adds something new, with a further purpose or different character, altering the first with new expression, meaning, or message.” He asked, in other words, whether and to what extent the new work is “transformative.”, adding that the more transformative the new work, the less will be the significance of other factors, like commercialism, that may weigh against a finding of fair use. But if your fan fiction story creates a new work that is based on the original, but transforms it into something new, that story could then be protected in its own right at least so long as it is a non-commercial work. “Fair use is a very large, very inclusive doctrine,” Tandy says. “Fair use covers everything from excerpting from a work for a classroom lecture to including a quote from a book in a play. Transformative work is a much smaller, much more restrictive idea. “One of the key questions is how much is original. So for instance, let’s say you’re writing a 1,000 word Harry Potter fan fiction story that’s built around the fact that JK Rowling was at King’s Cross Station in 2002. You may be drawing from Rowling’s seven book series, the eight movies, and the content on her websites, but all you’re using is a few sentences about her experience at the train station, and the rest of your work is noncommercial, then it’s transformative,” Tandy explains. You can even borrow some of the dialogue and location – the stage crafting behind the story – if you create an original story that is non-commercial and transformative, she adds. On Halloween of 2007, JK Rowling and Warner Brothers filed suit against a small U.S. publisher called RDR Books over its plans to publish Steve Vander Ark’s book, “The Harry Potter Lexicon.” The book was a printed form of a website that school librarian Vander Ark had been maintaining on-line since 2000. Rowling had given the Harry Potter Lexicon her “Fan Site Award” and wrote that “This is such a great site that I have been known to sneak into an Internet café while out writing to check a fact rather than go into a bookshop to buy a copy of Harry Potter (which is embarrassing). A website for the dangerously obsessive: my natural home.” But when Vander Ark decided to publish the work as a book – thereby commercializing it – Rowling and the other Harry Potter rights holders took action. “The judge looked at each portion of the book on its own, and found that 96% of the entries were transformative. The sad part is that it took two plus years of litigation for Warner Brothers and JK Rowling to get what the writer would have gladly done in the beginning if they had just asked him to do it,” Tandy adds. One of the hallmarks of fan fiction is that it must be non-commercial. Yet many of the sites have ads on them – so aren’t they commercial? Not necessarily, says Tandy. 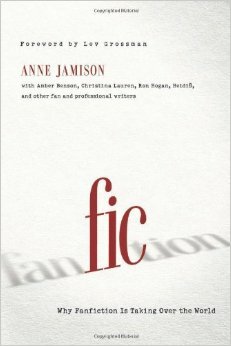 The commercial vs. non-commercial distinction is one reason most fan fiction writers publish their works on established fan fiction sites like Fiction Alley or Fan Fiction Net, rather than on their own websites. An exception is the James Potter series of books by G. Norman Lippert. Lippert was a successful illustrator and graphics artist, who began creating stories for his own children about the “next generation” characters outlined in the epilogue to Harry Potter and the Deathly Hallows. Rather than post his stories on one of the established fan fiction sites, Lippert set up his own website for them, and marketed them the way publishers market new titles, with teasers, Google ads, and press releases. His marketing campaign was so successful, that many people assumed that the first story was going to be published as a book, and over a million people downloaded the first chapter the first week it was published. Articles in USA Today and many other media outlets touted it as the “sequel” to the Harry Potter stories. “The way Lippert went about it caused him some problems,” Tandy explains. “Some of the publicity said that his stories had been approved by JK Rowling when in fact what she had said was that she approved in general of the idea of fan fiction. But by going outside the existing fan community, he got a bit of a backlash from within the community. “A sequel can certainly be transformative,” Tandy adds. “It depends on whether you are commercializing it or not, and whether or not you are taking away from something that the original creator or copyright holder has done or might do.” That, she explains, is why Margaret Mitchell, the author of Gone with the Wind, selected Alexandra Ripley to write Scarlett, the sequel to her 1937 Pulitzer Prize-winning novel. The author’s estate later authorized a second sequel, and a prequel is scheduled for publication later this year. “Gone With the Wind was the only book Mitchell published during her lifetime, but she always said that she ‘might’ tell other stories ‘someday’. So it was important that she protect her copyright carefully,” Tandy says. Commercial Fan Fiction on Amazon.com? Last year, Amazon.com created Kindle Worlds, a place where fan fiction writers can sell stories based on specific books, movies, TV shows and games. To avoid copyright infringement, Amazon struck deals with several authors and entertainment companies. Amazon gives them a cut of royalties and the rights to use the new characters and plot lines in the fan-fiction material in exchange for licensing their intellectual property. So far, Amazon has acquired licenses for 22 fictional properties, ranging from the novels of Kurt Vonnegut, to the comic series G.I. Joe, to Alloy Entertainment’s popular teen book and TV series Gossip Girl, Pretty Little Liars and The Vampire Diaries. The royalties paid to Kindle Worlds writers are a fraction of the royalties paid to self-published authors who publish elsewhere on Amazon.com, but it’s the first attempt to create a revenue stream specifically for fan fiction authors, Tandy says. Screen Capture of the Masters of the Universe Twilight fan fiction story before it was removed by E.L. James. On the other hand, if the most successful fan fiction writer to date, a writer who began publishing as Snowqueen’s Icedragon, had published her story Master of the Universe on Kindle Worlds, then she might have given up more than $95 million in income. That’s because Master of the Universe was the original title for Fifty Shades of Grey, and the book’s author E.L. James couldn’t have been able to keep the exclusive rights to the plot of the novels or be able to sell film rights. Ms. James changed the characters’ names and removed the vampire references from her Twilight fan fiction story so that she could publish it as an original work without violating copyright law. Last year, Forbes listed Ms. James as the world’s top-earning author, with an estimated annual income of $95 million. A Fifty Shades film adaptation is scheduled to come out next year. You can only sell or make money from your “transformative” work if you or your publisher have obtained permission from the rights holder(s). Consult a competent copyright attorney before attempting to sell anything based on a copyrighted work. If you publish your work on Kindle Worlds, remember that you are giving up some rights that you would otherwise have – such as the right to sell your work for film or TV use, and to control how your work is used by others. Even if you don’t charge for your work, and you believe that your work meets all of the criteria for a “transformative work”, you can still be held liable for using copyrighted images in your work. In fact, the banners and illustrations that fan fiction writers use in connection with their work remain the most common reason for a DMCA takedown request to the site where the story is hosted. Be wary of “social norms” found in online communities, because they can perpetuate legal misconceptions that get people into trouble. A recent study from Georgia Tech reveals many legal misconceptions persistent among different kinds of online. content creators. Last, but not least, publishing a fan fiction story doesn’t give you ownership of everything you published – especially not the portions that you used under the “Fair Use” provision of the copyright law. So the chances are that you can’t repeat what E.L. James did and change the names of your characters so that you can publish your story commercially. Not unless your plot can stand on its own, with no reference to the worlds, characters, or situations created by the original copyright holder. In March, 2016, Jonathan Bailey of Plagiarism Today allowed this blog to republish his brilliant article How Money and Fame Changed Fanfiction — it’s a must read for anyone seriously interested in the question of copyright, plagiarism, and profitability and fanfiction. If you’re seriously interested in the question of copyright and fan fiction, Jonathan’s article is a must read update. Gallery | This entry was posted in Law and tagged Copyright, Copyright law, Fan Fiction Net, fanfiction, Fiction Alley, Heidi Tandy, Kindle Worlds, rules for fan fiction writers, transformative works. Bookmark the permalink. Since this article was published, there was a ruling that even commercial works can be fair use if they’re sufficiently transformative: Techdirt fair use article. Basically, you now only have to make sure that your work doesn’t compete with the original. After arguing that pastiche is a form of commentary, of course (Thank God for last year’s changes to UK copyright law).